The New Year has begun with a stark reminder of the human cost of the bosses' economic crisis: young people are likely to suffer 'permanent psychological scars' as a result of unemployment, according to the newly released Prince's Trust YouGov Youth Index. The report shows that being unemployed affects young people's health, friendships and family life. This is hardly surprising. Unemployment for under-25 year olds means living on Jobseeker's Allowance of just £50.95 per week. On this poverty income young people cannot afford to go for a night out, buy a CD or DVD, let alone think of a holiday. Even something as simple as using the bus becomes a difficult financial decision. It is no wonder that personal relationships suffer and that unemployed youth are 'significantly less happy' than those in work when forced to live in these circumstances. When you factor in the reduced housing benefits that under-25s are entitled to, the reality is that young people are forced into dependence on friends and family. With so many families struggling to get by anyway, it is no wonder that 25% of the young people questioned said that their unemployment had led to arguments with parents and friends. Add to this the right-wing media's portrayal of benefit claimants as lazy and worthless, coupled with the ideas portrayed in TV programmes like The Apprentice and Dragon's Den suggesting that it is down to individuals' own efforts and strengths whether they are 'successful'. It is no wonder that self-esteem suffers and one-in-three unemployed youth report that they 'feel down or depressed most or all of the time'. The overall impact of this according to Professor David Blanchflower is "an unhappy and debilitated generation of young people who...become decreasingly likely to find work in the future". Young people are being asked to put their lives on hold until the bosses' profits are restored and recruitment picks up again. Unemployment is a cruel punishment inflicted on the young for the failure of the free-market system. The fat cats have messed up people's lives by wrecking the economy and making working-class and young people pay for it. The situation facing young people will only get worse as the politicians line up to take the axe to the public sector, doubtless scaling back the already meagre help to the unemployed. Measures to tackle what many experts have called a 'national emergency' have so far been inadequate in every respect. 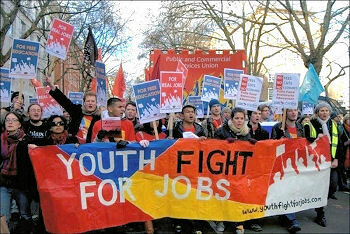 Young people need permanent jobs that are socially useful and pay a living wage. New Labour undertook the biggest intervention in the economy in history when they bailed out the banks. Why can't the government intervene to help the next generation? Why can't it bail out young people? Capitalist politicians will claim the cost is 'too high'. This report shows the cost of doing nothing is far greater. The right to a decent job for all, with a living wage of at least £8 an hour. An end to cheap labour apprenticeships! All apprenticeships to pay at least the minimum wage, with a job guaranteed at the end. An end to university fees. Support the Campaign to Defeat Fees. Take part in the Youth March for Jobs on 13 March in Barking, east London, where the racist BNP leader Nick Griffin intends to stand in the 2010 general election.